Today, I'm celebrating. June 4th is my three year blogiversary as Thomas MacEntee at GeneaBloggers has branded it. 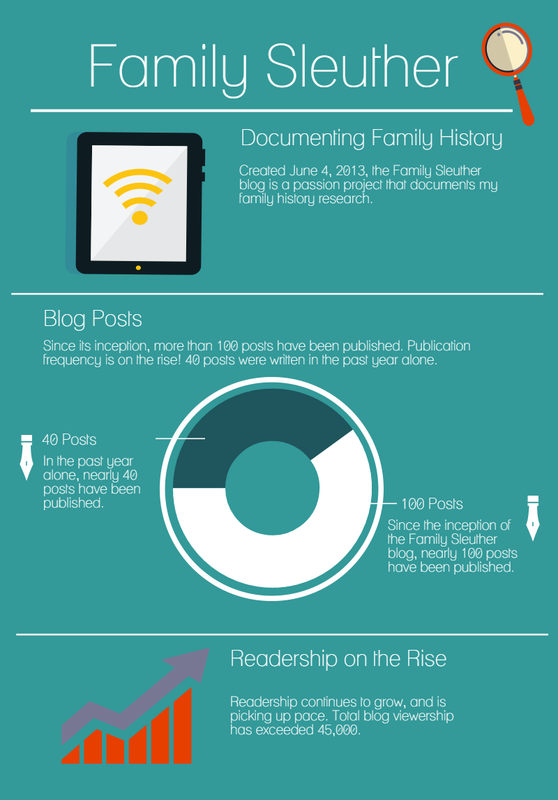 Three years ago I published my first post as the Family Sleuther. "...there's something compelling about placing your own kin in their historical place and rediscovering people the world has long forgotten. It has captivated me and sparked an addiction to genealogy." That addiction continues unabated and has yielded a handful of successes. Since its inception, I have published nearly 100 posts and the blog has racked up more than 45,000 page views. In the past year alone, I've published over 40 posts, including my most read piece about genetic genealogy's role in revealing the identity of my paternal great-grandfather. Not too bad for an amateur family historian who can only dedicate time to research and blog when his demanding day job permits. Writing my family history forces me to carefully process my research and think about about the gaps that become apparent once it's in black and white. Blogging makes me a more focused, discerning genealogist. I ask more questions. Blogging puts my family history into the public domain for others - even distant cousins - to find. One day a distant cousin is going to take the bait, realize we share a family bond, and reach out with a long-lost bible, family photo, or [insert family treasure here] that allows me to finally bust through a previously impenetrable brick wall. This blog has become an archive for my family history. It documents my finds in real time. If I find my enthusiasm to pursue a challenging research puzzle starts to wane, I can pop onto the blog for a dose of motivation. It's inspiring to be reminded of past success. For the year ahead, I aim to consistently blog, hopefully expand readership, tell more of my family's history and answer some of our outstanding mysteries, and even polish the technology I use to deliver and present this blog. Grab your pipe, deerstalker cap, and Sherlock wit, we have an exciting year of family sleuthing ahead of us! Congratulations on your third anniversary. I enjoy reading your posts. Thanks, Linda. I appreciate that! I enjoy your blog, too. Hope you're enjoying SCGS Jamboree. Happy anniversary. MANY happy returns, and many more adventures in genealogy to blog about. Thank you, Janice. I've loved the adventures to-date and look forward to blogging through many more! Happy blogiversary! Your love of blogging and genealogy certainly comes through your posts. Thanks, Michelle! I'm glad to hear the love comes through.